I am the WORST at holidays. I am not a big fan of festive holiday home decor, at least in our house, and I seldom manage to get holiday cards out on time. This year, though, I've got an ace up my sleeve. The Stationery Studio has a great selection of christmas-cards that can be personalized to fit any family… even ours! Their designs range from simple and casual to elegant and foil-embellished. We don't really do the formal family portrait thing (are you really surprised? ), so I decided to use one of the first day of school candid shots I took of the kids this year. 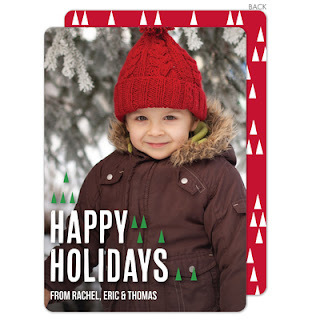 The design I chose was the Red Pine Trees Holiday Personalized Photo Card, which features a single family photo on one side, with a bold geometric pattern reminiscent of a Christmas tree forest on the reverse. Much to my surprise and delight, the quality card stock and lustrous matte finish of the printing made my iPhone snapshot look almost… professional. Certainly intentional, at the very least! The cards and envelopes arrive in a heavy weight linen-textured keepsake box that makes it easy to keep everything in one place. It's not even Thanksgiving and I have the holiday cards ready to be stuffed with this year's school portraits. Thanks to The Stationery Studio for kicking our holiday season into high gear.